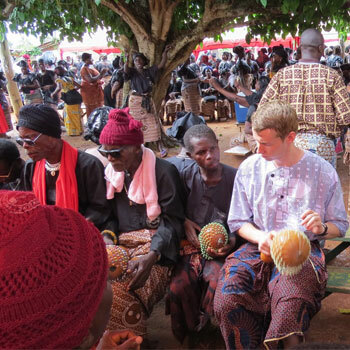 Experience participatory music-making, critical discussion, and reflective and experiential assignments on a special field course in Dagbamete, a remote village in the Volta Region of Ghana. From May 10–26, 2019, become immersed in the vibrant musical culture and community life of the village. A small group of students will be led by Kathy Armstrong, a trained percussionist and music educator, as well as guest lecturers and instructors based in Ghana. The course will be based at the West African Cultural Exchange Centre in Dagbamete, which is founded and directed by Kwasi Dunyo — a master Ewe drummer from Ghana. Students will also spend some time exploring the urban musical culture of Ghana’s capital city, Accra, with sessions at the University of Ghana at Legon. Immerse yourself in a cultural experience, where arts are integrated into everyday life. Practice experiential learning at its best. Learn more about yourself as you connect with people and experiences outside of your norm. If you’re interested in this opportunity, apply before Jan. 18, 2019. Contact Deanna Yerichuk, assistant professor and Community Music program coordinator, at dyerichuk@wlu.ca for the application package. Students from all faculties are welcome. A minimum of 15 students is needed to run the course. Applicants should be finishing their first year by May 2019 (at the minimum). Applicants should have some school, professional or personal experience in community studies, global studies and/or music. To learn more and get the application materials, please contact Deanna Yerichuk at dyerichuk@wlu.ca.